Crusts in unseeded fields can be broken by working the fields very shallow, no deeper than the depth of the crust, with such tools as a rotary hoe, a field cultivator with narrow shovels or spikes, or a rigid harrow. Breaking the crust will help dry the field more quickly and warm the soil. Some compaction will result from the extra trip over the field, but the benefits of the tillage should outweigh the negatives. In seeded fields that received heavy rains after seeding and developed crusts, breaking the crusts may be crucial for good stand establishment and to avoid reseeding. A rotary hoe is the best tool for breaking a crust. A spring-tooth harrow with the teeth set straight down instead of slanted back can sometimes be used. The circular motion of harrow teeth set in this fashion can be very effective at breaking a crust enough for young seedlings to emerge. A heavy rigid harrow should be avoided as too much soil movement may expose seedling roots. If neither of these tools is available, running over the field with and empty double disc drill will also break the crust. The goal of any crust-breaking trip is to crack the crust into small pieces and move them around slightly to let air and light into the soil below. Seedlings trapped under a crust will try to grow and elongate below the crust until they run out of stored energy from the seed. 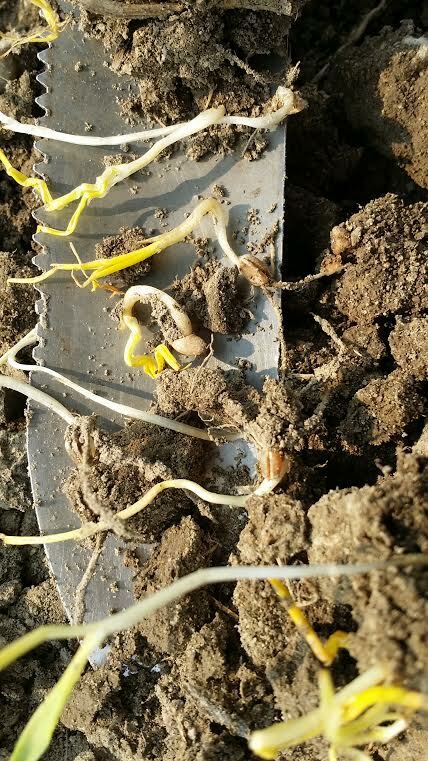 The cooler the weather, the longer the seedling can survive, unless a seedling disease infects it. The warmer the temperature, the faster the seedling will try to grow and the sooner it will run out of energy. It is important to deal with crusts soon after they form. With any crust-breaking method, some stand damage is likely. However, compared to the damage a crust can do, the damage done while breaking crust is usually much less than the crust itself causes. The rain that we are getting today will help to soften the crust. Hopefully it is in time so that the rest of the corn will come up.